If my booze-soaked memory serves me, we went shopping at the Summerhill LCBO to spend the final gift cards Rob acquired for his birthday and to do some post-Christmas exchanges. 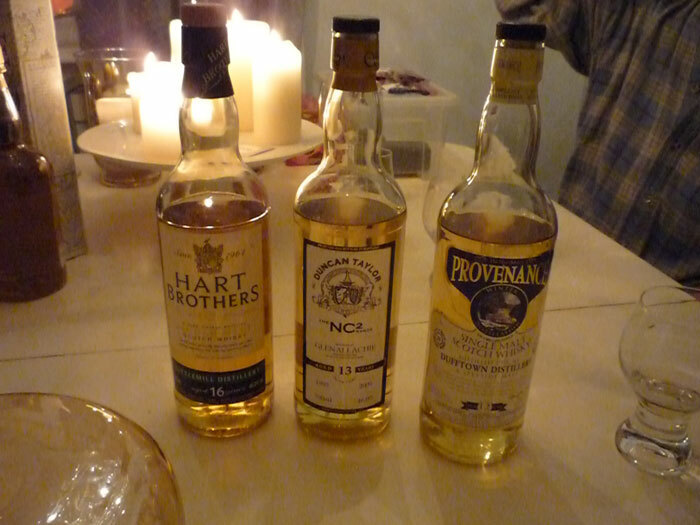 What was bought was a Glenallachie 13, a Dufftown 12 and a Litttlemill 16; also a Yamikaze 8 year old vatted malt. I exchanged my Forty Creek Port Wood for a Glenfiddich 18. We went to Rob’s and had some and took some tasting notes but only Rob knows what became of those. One of them was Sardines, one of them was Krispy Kreme donuts, one of them was a trip to the front porch, and it gets pretty blurry after that. The fact that there have been a few shopping trips and more than a few nights of whiskey since then really illustrates why it is so important to write these posts while still loaded at 3 or 4 AM on the night in question.